Walter White’s roof just can’t catch a break. The real-life house that served as White’s home in Breaking Bad is still being pelted with pizzas, according the Huffington Post. The whole ordeal stems from a season three episode of the AMC series wherein White tosses a large pizza on his roof during a moment of frustration. 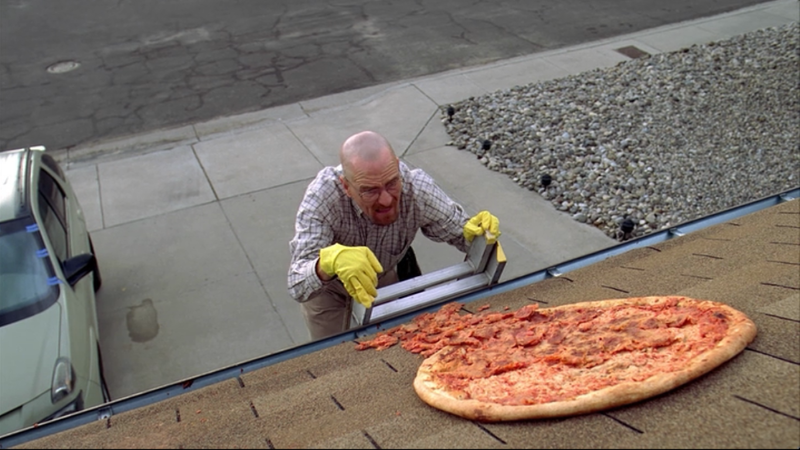 Since, fans have been paying homage to Heisenberg by tossing pizzas on the Albuquerque home of Louis and Fran Padilla. Time to leave the house in peace-a, you guys. What do you think? Is it rude to keep throwing pizzas on this private home? Besides the infamous pizza-throwing, what’s your favorite Breaking Bad moment? More about: AMC TV shows: canceled or renewed?, Breaking Bad, Breaking Bad: canceled or renewed? Of course, they should stop. It’s just vandalism at this point. The people throwing them there probably don’t see it that way and only think it’s funny or maybe even a tribute to Breaking Bad. But looking at it as if people were doing this at your home, no matter the reason, it would be a real pain in the A**! Just promote a picture opportunity, charge a small sum, byo pizza, viola! Income for little work as long as breaking bad is still a thing.